Staying present and compassionate toward ourselves frees us to express our unique creative wisdom. So why this topic -- self-compassion? And what does it have to do with painting for process? Well, let me ask you, when you are painting, or expressing yourself creatively in other ways -- singing, dancing, writing, drawing, and so on -- have you ever experienced self-criticism? Self-judgment? Feeling vulnerable? I have, and I’m guessing you have, too. Self-criticism can be paralyzing. It can stop us in our tracks, make us put down the brush or pen, or turn off the dance music. That paralysis doesn’t serve us -- or anyone else for that matter. It’s not possible to be alive and not be engaged in the creative process. Creativity is not an add-on that you either have or don't have. It’s essential to the very way in which we live and engage our own individuality. Perhaps self-compassion can help us all find a bit more freedom to dive into the mystery of creative expression. One of the most well-recognized teachers of self-compassion is Dr. Kristin Neff, a researcher at the University of Texas at Austin. After listening to a recording of a daylong workshop and reading her book, Self-Compassion: The Proven Power of Being Kind to Yourself , I have developed a great appreciation for the power of this practice and the ways it can support presence and authentic expression. The willingness to accept our own foibles can open the door to freedom in creative self-expression. Consider the opposite -- self-criticism -- for a moment. When we are self-critical, the primitive part of our brain senses a threat and sends all sorts of chemicals, including cortisol and adrenaline, into our bloodstream to activate our sympathetic nervous system, commonly called our “fight/flight response." Our self-concept is threatened. When we’re in this fight/flight state, the thinking, creating and intuiting parts of our brain shut down. The brain becomes concerned with nothing more than survival. Fortunately, we’re also blessed with the innate ability to give and receive care, soothing, and comfort -- a cycle that facilitates growth. (This is called the mammalian caregiving system.) Infants are able to instinctively receive soothing, which helps them feel safe. The parasympathetic nervous system is activated, oxytocin is released and there is a sense of connection and calm. The activation of the parasympathetic nervous system allow us to rest and digest -- and to create. Self-compassion initiates this healing cycle, too. 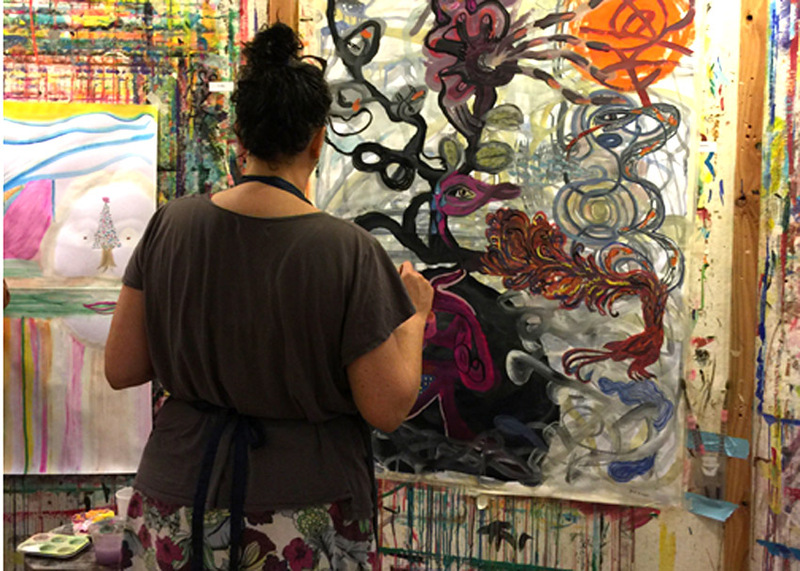 Just the other day when I was in the early stages of a process painting, I noticed the judging voices in my mind suggesting, “just start over, get rid of this painting, it’s so childish and nothing goes together.” Self-compassion practice lets us embrace these familiar tendencies with kindness and give them some space to change on their own. 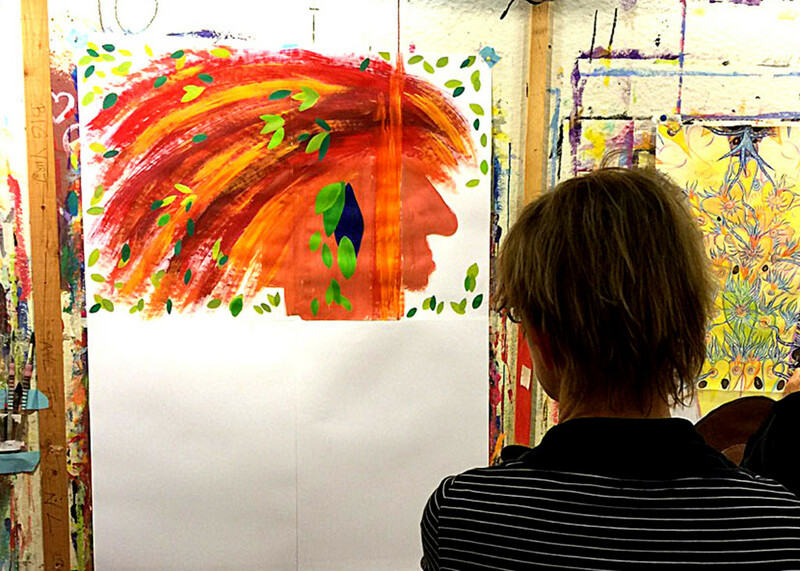 As I kept painting, with care for myself and the process, I realized I’d been ignoring an image that wanted to appear. It was an image I was judging as unnecessary, crude, embarrassing, and so on. But as soon as I moved toward the image and allowed it to show up in the painting, the joy returned and the critical voices took a back seat for awhile. Being compassionate with myself in the midst of hearing the judging inner critic allowed me to hang in there and get re-energized in the creative process once again. How do we practice self-compassion? Kristin Neff invites us to consider the following components of self-compassion. Mindfulness: We notice there is suffering and how difficult the experience is. Self-Kindness: We feel moved by the suffering such that our heart responds to the pain. Common Humanity: We realize that suffering, failure and imperfection are part of the shared human experience. When confronted with painful experiences we can practice noticing that this is a moment of suffering, that all humans suffer, and that -- just as when we feel compassion for others -- perhaps it might be best to proceed gently and kindly with ourselves. Parts 2 and 3 of Molly’s exploration of self-compassion and the creative process are coming soon. 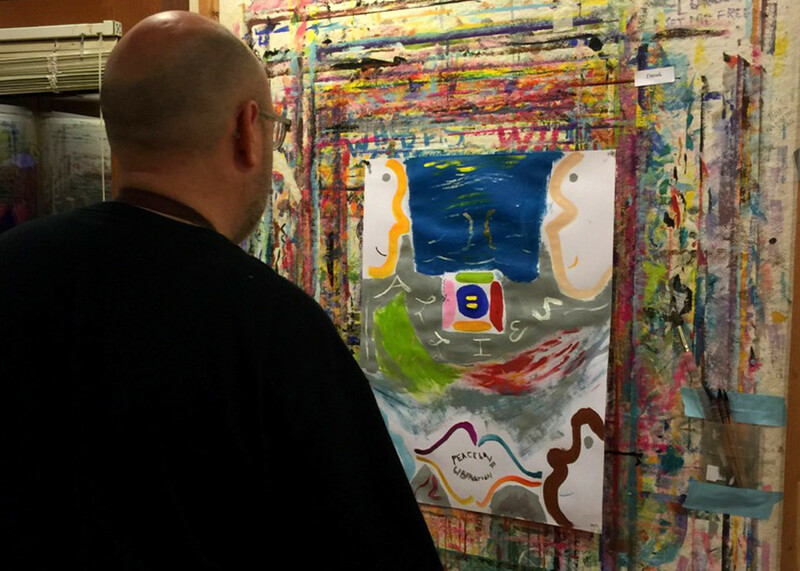 To learn more about how painting for process can help you transform self-judgment, listen to Stewart Cubley’s talk, The Inner Critic. You can find Kristin Neff’s website at www.selfcompassion.org. 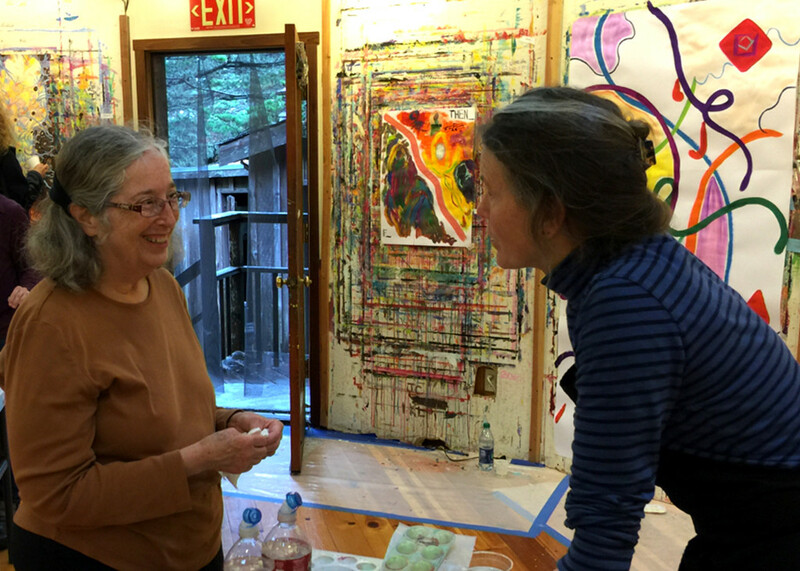 Molly (right) talks with a process painter at a workshop held at the Esalen Institute in December 2015.